The social media team for popular video game franchise Call of Duty has been replaced. That’s OK, though, they asked for it. The Replacer, introduced prior to the release of the first downloadable content pack for “Call of Duty: Black Ops II,” specializes in replacing you in your day to day life, freeing you up to play more Call of Duty. Now that they are releasing their download pack, he’s made a triumphant return. Family commitments, doctor appointments, your day job, whatever – he can step in and do the job. Don’t know him? Watch this video. 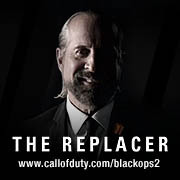 As I write, The Replacer, portrayed by Peter Stormare, is currently “in charge” of their Facebook, Twitter and Google+ pages. He also has his own website at getreplaced.net. His updates are wonderful and hilarious. For example, he asked people to “retweet” his Facebook update, made a joke about social media webinars and confirmed there are no good memes today. View the streams and his replies on Twitter, for more random funny. This is a really great example of entertaining engagement.